This type of blower is absolutely perfect for any type of inflatable advertising tool or child play house. A very common use for them is at children's birthday parties with an inflatable bounce house. This model is the most powerful unit in our inflatable blowers category. For even more powerful units, take a look at our carpet dryers & fans, which can move up to 4000 CFM of air. For extremely large bounce houses that you see at fairs and carnivals a larger fan like this one is the only way to keep these play houses continuously inflated. If you are a rental facility or a just a doting parent who wants to offer a bouncey house for your child to play in, this inflatable fan is the most economical and powerful bounce house blower that we have to offer. Inflate your play area in mere seconds! 1 HP motor inflates most children's bounce houses in mere seconds. 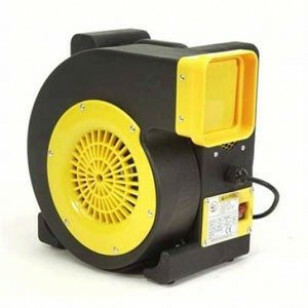 3450 RPM wheel fan produces 980 CFM of air movement, making this the strongest inflatable blower we have to offer. 25' power cord allows you to blow up inflatables anywhere. Rubber feet help to keep the blower in place and prevent it from scratching any surface. 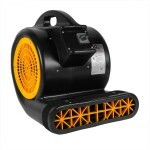 At only 28 pounds, you can easily transport the blower to wherever you need it. This is a review for the Children's Bounce House Inflatable Blower.